I’d recently thrown away all our plastic plates, and I didn’t want to contaminate my watercolor palette with acrylics, so I played around a bit and realized it is completely possible to paint an ombre effect without mixing the paint ahead of time! It’s easiest if you have two or three brushes, but the effect can be accomplished with a single brush if you work quickly. 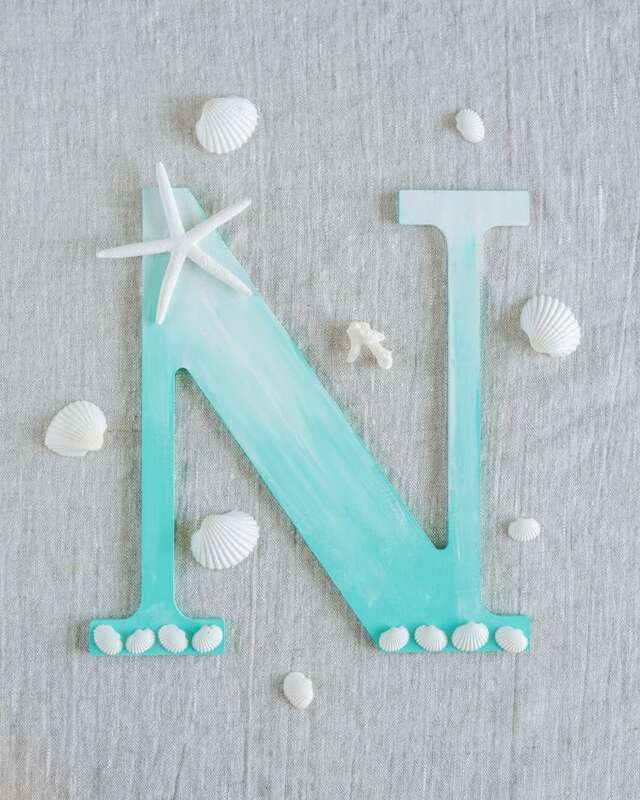 Of course, I added some tiny shells and a starfish to my letter, but everyone knows I love the beachy vibe! If this isn’t your thing, it’s very easy to modify the colors and accents to suit your personal style. A wood letter! Mine is 9.5″ high and came from a local craft store. Similar letters usually easy to find at pretty much any craft store. If you can’t find any locally, check with Woodcrafter. I shop with them a lot and they have fantastically prompt service! Two colors of acrylic craft paint. I used turquoise and white. One or more paint brushes. You could use a foam brush, but for this project I prefer a flat “regular” paintbrush. Use one that is at least 1/2″ wide, preferably larger. Wax paper or a teflon crafting mat to protect your work surface. Hot glue. I recommend a top hot glue gun tips & tricks! Update: If you craft with hot glue and you don’t have silicone finger protectors, you need them right away! They can save you from so many fingertip burns! 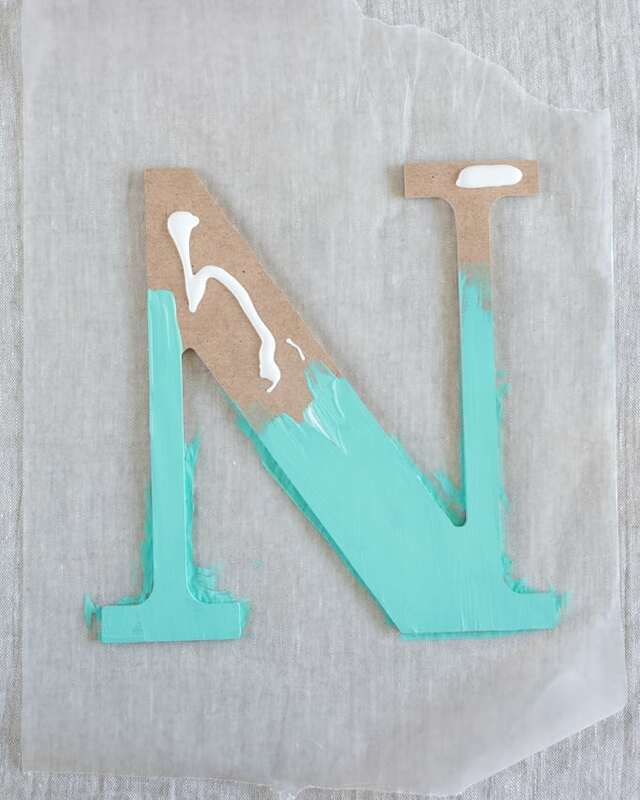 Add paint to your letter. You don’t need to add both at once like I show (and you probably don’t need as much as I put on my letter, either! It turned out to be a bit too much and I had to wipe some off on the wax paper); you can just add the darker color on the bottom part of the letter. Brush the paint up to cover the bottom 2/3 of the letter, making sure you also paint the sides (this is why it’s important to protect your work surface and why a flat brush works better than a foam one). Work quickly and use enough paint that it is still damp when you finish painting. Quickly wash your brush and dry it with paper towels, or grab a clean brush. 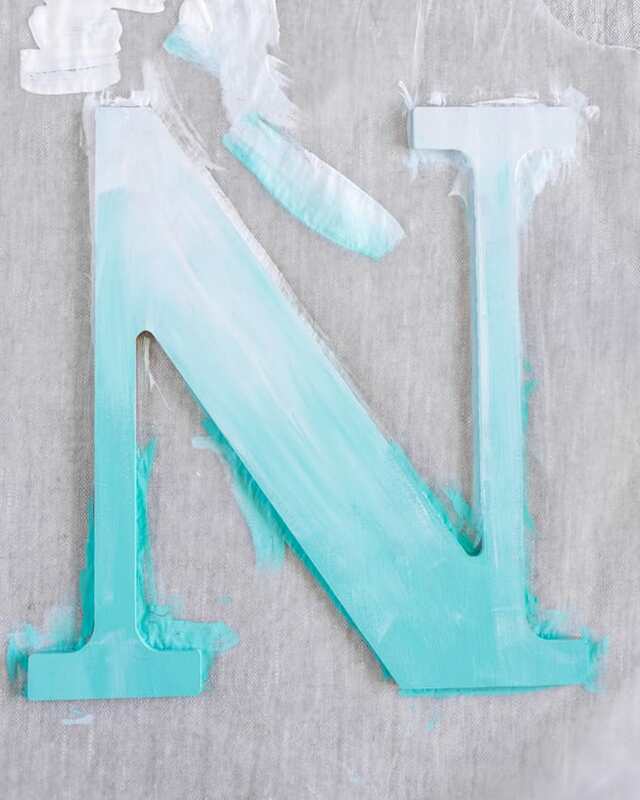 Paint the top portion of your letter white, or whatever your lighter color is, then begin dragging the white paint down. Work quickly so that the lower paint color is still wet enough to blend! If a lot of your darker color gets on the brush, wipe it clean on a paper towel before going back into the white paint in order to prevent the top from becoming too mixed. Again, make sure you paint the sides. 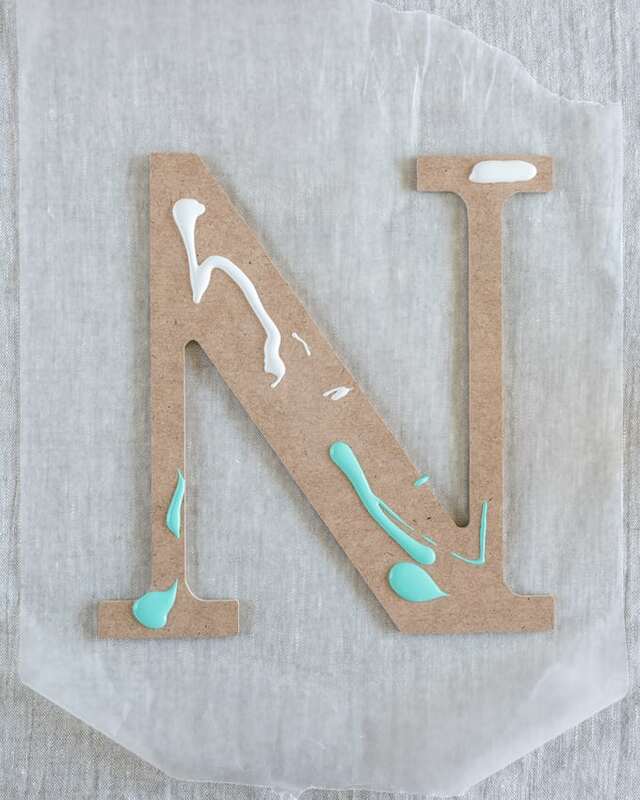 To keep your letter from sticking to the wax paper, cut a new, clean piece of paper and carefully transfer the letter before it has a chance to dry and stick. 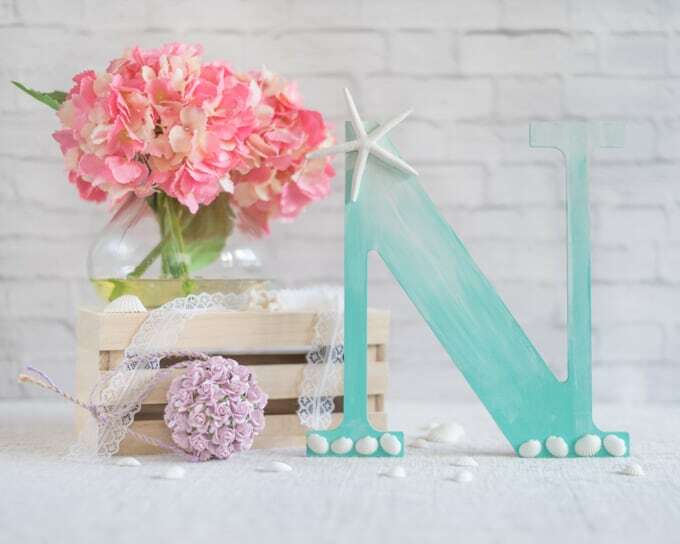 After the letter is dry, you can either use it as-is or decorate! I recommend playing around with your decorative items a bit before gluing them in place. When you’re happy with the way things look, grab your glue gun! 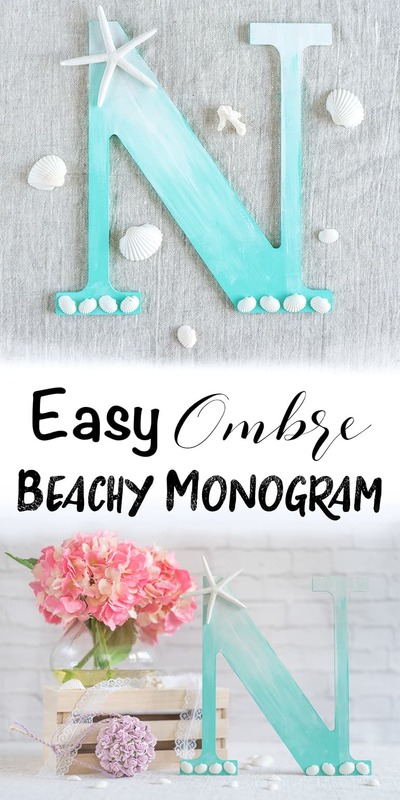 Enjoy your lovely new beachy ombre monogram! As I mentioned above, this project would be easy to modify for a different decor scheme. You could make it rustic with twine or sola flowers, more sweet with artificial blooms, or just leave it painted without additional decoration. There are so many possibilities! 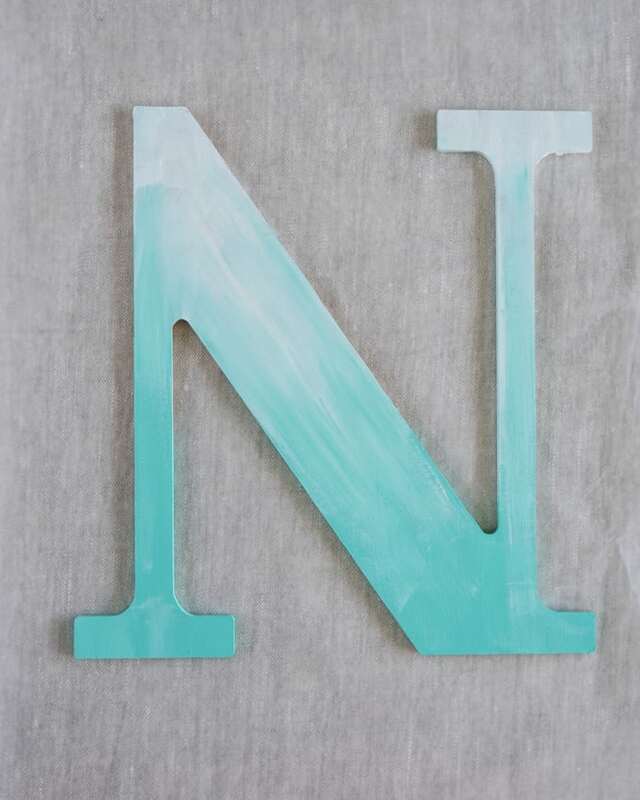 What colors and theme would you choose for a monogram letter? Interesting effect of putting the paints on your object first then quickly blending them. I bet your process would also work great on many other objects! Thanks for sharing your “ombre” secrets! It probably would work on other small objects! I hate mixing paint for an ombre effect and finding out I’ve wasted a whole lot extra or don’t have enough and can’t get the mix right again. This method helps solve those problems! Beautiful! 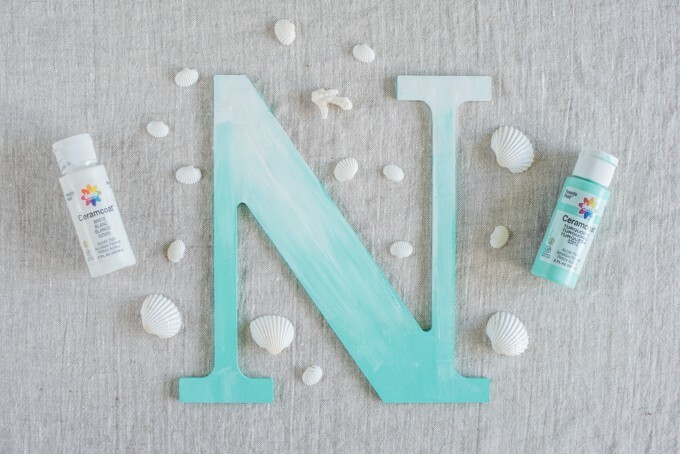 I love the ombre effect, and the turquoise you chose is so perfect for a beachy theme. Previous post: Seaside Sunset Bokeh Freebie Pack!